In 1967, the Potlatch Lumber Company donated the Mary Woods No. 2, a working paddle wheeler tugboat, to Jacksonport State Park. The boat then underwent major renovations and was refurbished to look like a steamboat of the 1860’s. Here, it sits close to its berth just below the Jacksonport Courthouse, loaded with county residents dressed in 1860’s garb, ready to participate in the 1973 educational film Jacksonport Round the Bend. Under the supervision of Lady Elizabeth Luker, museum curator, the Mary Woods became a steamboat museum,displaying at every turn what life would have been like for passengers and workers on a river trip. Staterooms and the main room were furnished with period objects, and in 1976 it opened as a floating museum and operated as such for 30 years. Unfortunately, the Mary Woods No. 2 sank in an ice storn in 2010, and its superstructure was so heavily damaged that it could not be restored. 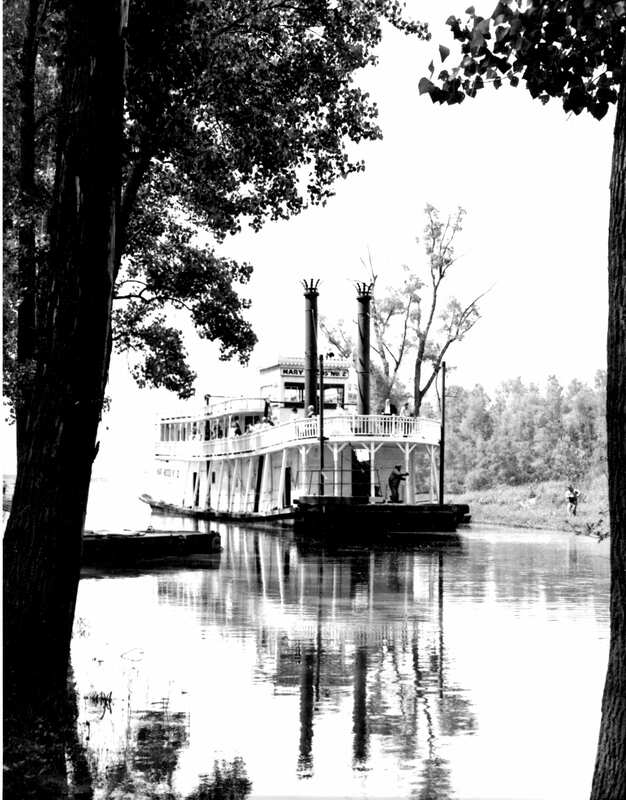 This elegant paddle wheeler was a fitting symbol of the culture that grew up along the river it served.